FOR IMMEDIATE RELEASE—May 2, 2012—ANN ARBOR, MI—Logic Solutions and the Almin Group are pleased to announce the release of PlayerPrep for iOS and Android, a mobile app that digitizes and simplifies NCAA compliance regulations and other important legal information for current and prospective student athletes. 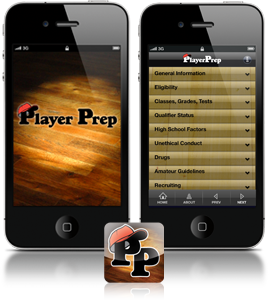 The PlayerPrep mobile app provides invaluable compliance information to prospective student athletes, their parents/guardians, counselors, and coaches, to guide them in the process of becoming a college athlete. This unprecedented access allows students to better protect themselves from the overzealous booster or misguided coach and avoid being part of a violation, or worse, a scandal. PlayerPrep also includes critical, basic legal information regarding contracts, misdemeanors, substance abuse, landlord-tenant and other areas that can be a distraction to your student athletes and your school’s mission to educate young adults. Ultimately, PlayerPrep helps students begin to familiarize themselves with relevant bylaws and the importance of being an athlete who knows and follows the rules. Through years of experience working with students, legal and education experts David and Janet Sutherland recognized that young adults not only have the ability to understand complex legal concepts, but that they enjoy the pride that comes with appreciating how relevant and crucial it is to know how the law impacts their lives. The key to cultivating that comprehension lies in the manner in which the information is presented. Player Prep (and the soon-to-be-released ConductCoach apps for collegiate athletics) was developed over hundreds of hours with the specific purpose to transform complex regulations into language and an organizational structure that would be easy for students to grasp quickly, and assist them in making sound decisions as student athletes. Written in HTML 5, the native application opens with a menu system that is easily organized according to a specific category of NCAA rules, such as Eligibility, Drugs, and Amateur Guidelines. The user may expand or collapse the menu options with a quick touch, navigating with ease. After selecting a category button, the user can read the selected regulations. Unlike typical compliance instruction programs presented through slide presentations, the PlayerPrep app ensures that students, coaches, and staff members have compliance materials with them whenever and wherever they have their mobile devices. No longer does the compliance education end when the lights come up and the presentation concludes—the compliance education continues at all times. PlayerPrep is available for $3.99 on the App Store and Google Play. Our mission since 1987 has been to foster the intellectual growth of students in the late teens to early twenties. Young adults in this age range have unique needs as learners, and must be given the respect they are due. We must also interact with young adults with patience and understanding, because there are life experiences that they have not yet encountered. Our mobile apps: PlayerPrep, ConductCoach, and ConductCoach-Recruiting enable and ensure that students, coaches, and staff members have compliance materials with them whenever and wherever they are, to help student athletes make sound decisions and achieve success. For more information please visit http://www.almingroup.com.